Dollar was sold off broadly overnight after Fed’s dovish FOMC statement. And it remains the weakest one for today. US equities also surged sharply and risk appetite was carried through to Asian session. Riding on this, commodity currencies are generally higher, as led by Australian Dollar. However Yen also remains resilient for now, as helped by deep decline in USD/JPY. Meanwhile, Sterling is the second weakest following Dollar on Brexit uncertainty. Swiss Franc is the third weakest. Technically, EUR/USD resumed the rebound from 1.1289 and breached 1.15 handle. It’s targeting 1.1569 resistance and above. 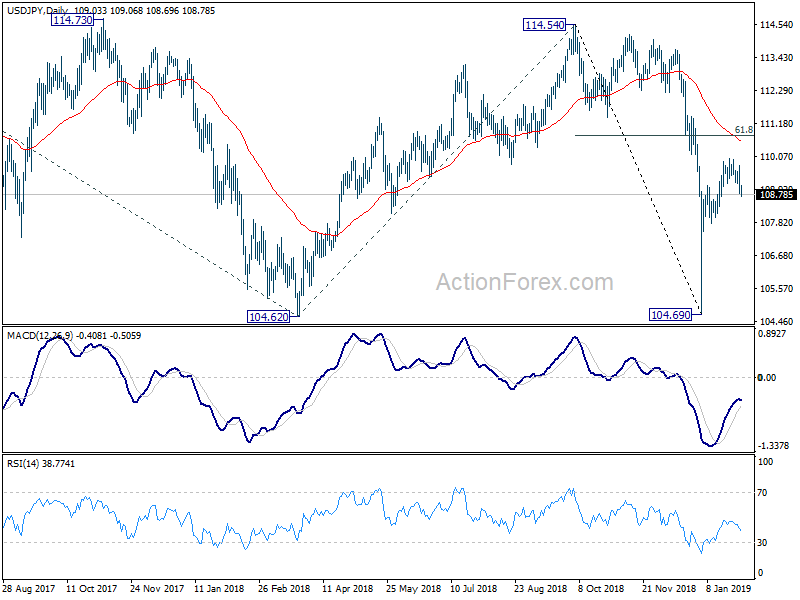 USD/JPY’s break of 109.14 suggests completion of recent rebound from 104.69 and 107.77 support is next downside target. 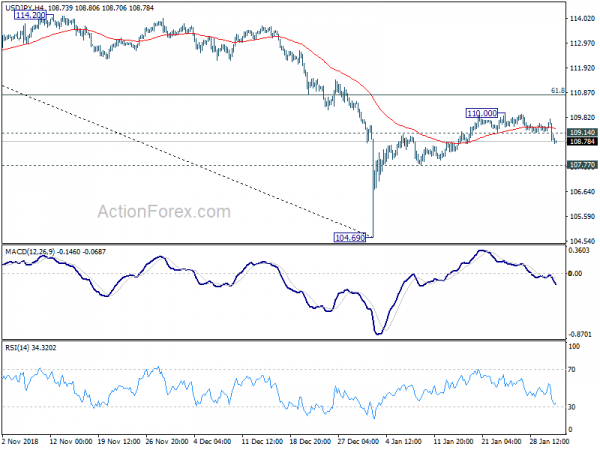 AUD/USD’s break of 0.7235 indicate resumption of rebound from 0.6722, for 0.7393 resistance. USD/CAD also resumed the fall from 1.3664 by taking out 1.3180 support. Dollar will look into tomorrow’s NFP as savior, or some positive news from US-China trade talks. In other markets, Nikkei closed up 1.06% at 20773.49. Hong Kong HSI is currently up 0.92%. China Shanghai SSE is up 0.17%. Singapore Strati Times is up 0.42%. Japan 10-year JGB yield is down -0.0018 at 0.002. Overnight, DOW rose 1.77% or 434.9pts to 25014.86, reclaimed 25k handle. S&P 500 rose 1.55% to 2681.05. NASDAQ rose 2.20% to 7183.08. 10-year yield dropped -0.017 to 2.695, back below 2.7. Fed left federal funds rate unchanged at 2.25-2.50% as widely expected. The overall announce was rather dovish. In short, Fed dropped the tightening bias language of “”some further gradual increases” in interest rate. Instead, Fed said it would be “patient as it determines what future adjustments”. On balance sheet reduction plan, Fed is “prepared to adjust any of the details for completing balance sheet normalization in light of economic and financial developments”. But no detail was revealed yet. On economic assessment Fed stay activity has been “rising at a solid rate” rather than being “strong”. Also, “market- based measures of inflation compensation have moved lower in recent months”. Markets firmed up their pricing that fed will stand pat throughout 2019 after yesterday’s FOMC statement that adopted the “patience” language. Fed funds futures are pricing in 82.5% chance of federal funds rate staying at current 2.25-2.50% after December meeting. It compares to prior day’s 72.0%. Nevertheless, it’s not that higher than 79.3% a month ago. Treasury yields responded with 30-year yield rose 0.012 to 3.053. 10-year-year yield dropped -0.017 to 2.695. 5-year yield suffered steep decline and dropped -0.044 to 2.503. 1-year yield dropped -0.008 to 2.606. Yield curve from 1-year to 5-year has indeed inverted more after FOMC. BoJ released summary of opinions of January 22/23 monetary policy meeting today. It’s noted there that “hard data suggest that the trend in Japan’s economy has been firm”. However, “some market participants hold excessively pessimistic views.” And, risks to overseas economies have been “increasingly tilted to the downside” and there are concerns that some “may materialize”. China PMI manufacturing rose 0.1 to 49.5 in January, up from 49.4 and beat expectation of 49.3. It’s, nonetheless, the second month of contractionary reading. It’s noted in the release that the continuous decline since August last year was finally broken, showing signs of stabilization. Slight increase in export orders also suggested that sharp decline export growth since November was slowing down. However, decline in new orders and backlog orders reflected downward pressure on demand. Overall, “the current economy has signs of stabilization, but the foundation still needs to be consolidated. Also from China PMI non-manufacturing rose to 54.7, up from 53.8, and beat expectation of 53.9. Also release in Asia session, Japan industrial production dropped -0.1% mom in December versus expectation of -0.5% mom. Housing starts rose 2.1% yoy in December, matched expectation. Australia import prices rose 0.5% qoq in Q4, above expectations of 0.3% qoq. UK Gfk consumer confidence was unchanged at -14 in January. Eurozone GDP will be the main focus in European session. Germany unemployment will also be featured. Later in the day, Canada GDP, IPPI and RMPI will be featured. US will release employment cost index, jobless claims, new home sales and Chicago PMI. USD/JPY’s break of 109.14 minor support suggests that whole rebound from 104.69 has completed at 110.00 already. Intraday bias is turned back to the downside for 107.77 support first. 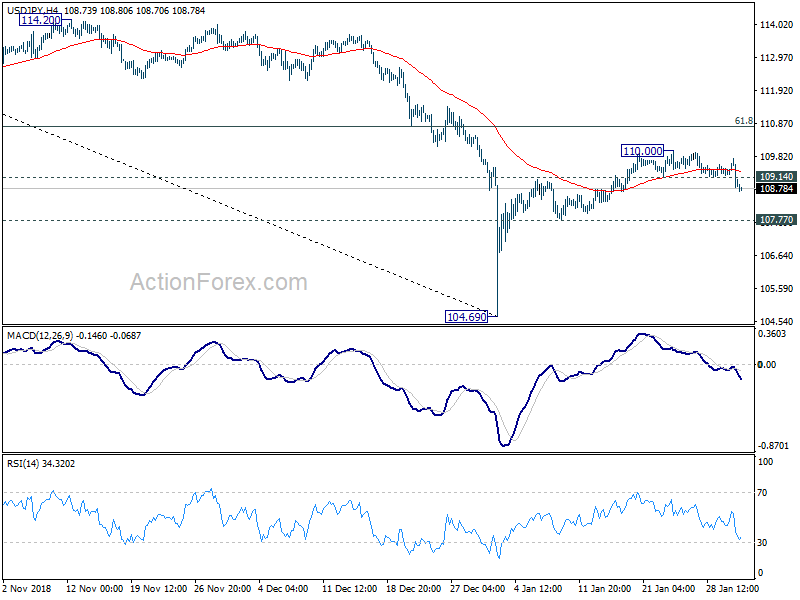 Decisive break there should confirm this bearish case and target retesting 104.69 low. On the upside, break of 110.00 will extend the rebound. But we’d expect strong resistance from 61.8% retracement of 114.54 to 104.69 at 110.77 to limit upside. In the bigger picture, while the rebound from 104.69 is strong, there is no change in the view that it’s a corrective move. That is, fall from 114.54, as part of the decline from 118.65 (2016 high), is not completed yet. Break of 104.62 will target 100% projection of 118.65 to 104.62 from 114.54 at 100.51, which is close to 100 psychological level. Nevertheless, sustained trading above 55 day EMA (now at 110.82) will dampen this bearish view and turn focus back to 114.54 resistance instead.